Upon closer examination, however, the appellate court may have not only affected this practice area, but also in certain cases, made it extremely, extremely (yes, I want to emphasize the point) difficult. On Dec. 4, the Dist. I court issued Montalvo v. U.S. Title and Closing Services, 2012AP102, affirming an order by Milwaukee County Circuit Court Judge John Siefert. The case involves Gustavo Montalvo and Carmen Rodriguez, who in 1995 purchased a home in Wisconsin. They were unmarried at the time, but the property was titled in both names. In 1999, they married. In 2003, Rodriguez filed for divorce. At a default divorce hearing, Rodriguez told the court she attempted to serve Montalvo but the Milwaukee County Sheriff’s Department was unable to locate him in Milwaukee County. She then issued a publication summons. The court explained that because service upon Montalvo was only by publication, it couldn’t change the title on the home to make Rodriguez the sole owner. The court characterized them as tenants in common and made no additional orders regarding the real estate. The divorcement judgment, however, awarded Rodriguez the home, but it was never recorded. In 2007, Montalvo emerged and was not amused to learn that not only was he divorced, but also that his wife had refinanced the house with his name somehow appearing on a quit-claim deed prepared by U.S. Title and Closing Services transferring title to her. She later sold the property. 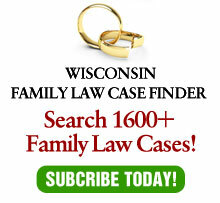 He brought a motion against her in family court under Wis. Stat. §806.07 to modify the divorce judgment to reflect his continued ownership in the home. Apparently unconcerned with the requirement that an action under §806.07 has to be brought within a reasonable time after judgment, Montalvo prevailed because he hadn’t been personally served in the divorce proceedings. The judgment was amended, awarding him half the proceeds of the house sale. Montalvo then brought a separate action against Rodriguez, the title company and others. A jury found that the title company engaged in a conspiracy to intentionally harm his ownership in the home, and assessed actual and punitive damages. The title company appealed. The Court of Appeals held that the court lacked the appropriate jurisdiction to transfer Montalvo’s interests in the property because he wasn’t personally served in the divorce action and didn’t appear in any proceedings pertaining to the divorce. Despite service by publication, the record didn’t contain any facts from which the appellate court could conclude that the court also obtained personal jurisdiction over Montalvo. Personal jurisdiction in fact, in addition to statutorily-accepted service, are conditions precedent to the exercise of jurisdiction in rem or quasi in rem upon a status or upon a property. Under §801.07, to affect the status of a defendant or property a summons must be served upon the defendant pursuant to §801.12. Under that statute, if the defendant is known (and, of course, the husband was “known”), he has to be served with a summons per §801.11. Under §801.11(1)(c), service may be made by publication if the defendant cannot be served with reasonable diligence. That is exactly what was done in this case. Montalvo clearly had sufficient contact with Wisconsin to satisfy the requirements of due process. Specifically, Montalvo lived in the Wisconsin home with Rodriguez from 1995 until February 2002. She filed for divorce in 2003. Therefore, Montalvo resided in Wisconsin in a marital relationship with the petitioner for more than six consecutive months within the six years preceding the commencement of the action, a ground for personal jurisdiction under §801.05(11). Under §801.11, once a court has subject-matter jurisdiction and personal jurisdiction under §801.05, it may exercise personal jurisdiction over a defendant by publication if, after exercising due diligence, personal service has failed. Inexplicably, the Court of Appeals didn’t reference §801.05(11), which is a clear basis for personal jurisdiction over the husband. Once personal jurisdiction exists, the court can order the house awarded to the wife, even if the husband was served by publication (assuming he couldn’t be found for personal service). The Court of Appeals was clearly unhappy with the title company’s “disingenuous at best” argument that the divorce judgment itself divested Montalvo of his interest in the home, since the record demonstrated that the company’s own document listed him as a co-owner. “The lack of candor with the circuit court and this court which the argument demonstrates is at the very least unfortunate,” the decision reads. But perhaps more unfortunate is the unintended problem the opinion creates for future family-law litigants – and it’s a huge one. Namely, if there’s a house in joint names and one of the parties cannot be found for personal service, under the Court of Appeals’ decision, the house can never be refinanced and can never be sold. Cue the music for Rod Serling standing in the corner. If personal service is required and the other spouse has disappeared, ownership is permanent. Admittedly, this is not a common situation, since few spouses totally disappear and those who do, don’t usually own real estate. But, it can and does happen. And, if the Court of Appeals’ analysis is correct, it leads to an absurd result.